Welcome to the Lucky Stars QAL! Step 1: Construct three rows as below. Star, patch, star, patch, star. Step 2: Construct four rows as below. Patch, square, patch, square, patch. Step 3: Sew rows together as in photo. We've been seeing sneak peeks from many of you and we're so excited! If you're behind do not panic! If you're just starting do not panic!! You have THREE FULL WEEKS to finish JUST THE QUILT TOP. 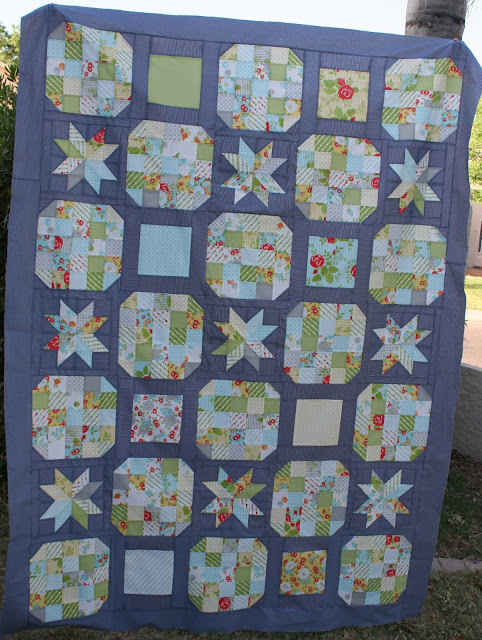 On August 7th you can link your quilt up to win awesome prizes. There are several all valued at $50. There is a high chance you can win fabric for your backing or your next quilt!! Good luck, please don't hesitate to reach out to us for help, thoughts or just so we can see your progress!! Oh I'm so excited! I just need to finish up my patch blocks and then I can assemble the top. still working on patch blocks, but really enjoying how it is coming together! After the link up, will you be giving instructions for how to finish the quilt? I've never done that. Should I wait or should I look for tutorials online?